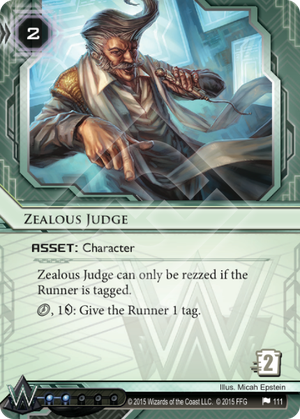 Can the Corp use Worlds Plaza to install Zealous Judge if the runner is not tagged? No. Worlds Plaza uses the phrase “if able”, which applies to the entire effect of installing and rezzing a card. Since Zealous Judge cannot be rezzed in this circumstance, Worlds Plaza’s ability cannot be used to install it. The Corp scores License Acquisition and the Runner is not tagged. Can the Corp install Zealous Judge with Licence Acquisition’s ability? Yes, but the Zealous Judge is not rezzed. So, this is a very interesting card. On the face of it this is just 'Win More' at its finest. If the runner is tagged why are you clicking to add tags, instead of clicking to Scorch/All Seeing I/Closed Accounts? But having played with it a time or two, the true effect of this isn't so much to bury the runner in tags as it is to make it harder for the runner to de-tag. Consider. Second click, runner runs R&D through a Data Raven. Plan is to de-tag third click. After he passes it, however, you rez the ZJ. Now the runner has to spend his third click running over and trashing the ZJ, or else his de-tag will be undone on your first click. This is still doable. Runner who gets tagged second click can run over to ZJ and trash third click, then detag fourth click. But throw in a Snare! on the second click access? Or another Raven in front of the ZJ? It's easy to imagine situations where the runner can't get de-tagged. This is basically an attack not on the runner's econ (the all important Corp vs. Runner cred totals aren't naturally changed by the corp spending 2 to rez, runner spending 2 to trash), but on their clicks. If they have planned out a click to detag they may receive an unwelcome surprise when it basically takes 2 clicks and 4 creds instead. Bottom line, every runner knows how bad it is to end the turn tagged. Either your deck is built around it, or you are wincing in preparation for incoming meat damage/yellow tag punishment cards. From now on 'end the turn tagged' is mostly equivalent to 'end the turn with a ZJ rezzed'.